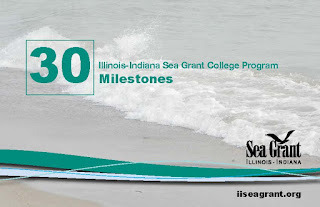 Illinois-Indiana Sea Grant is celebrating its 30th anniversary, and 30 years of working to protect and preserve the beauty and resources of Lake Michigan. But what is some of that work? What are some of the things that IISG does to understand, restore, and celebrate our Great Lakes resources? We’re glad you asked. Our latest publication features 30 milestone achievements selected from the last three decades, all detailing ways that we support our mission to improve and protect the southern Lake Michigan area. Visit the link to download your own copy of our 30 milestones, or contact us if you would like print copies to share with. And here’s to the next 30 years of keeping our Great Lakes great!